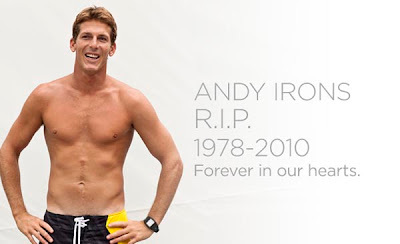 Yesterday pro-surfer Andy Irons passed away in a Dallas TX hotel room. He apparently had checked into a hotel because he wasn't feeling well enough for the long leg en route from Puerto Rico (where he dropped out of a competition due to illness) to his home in Hawaii. He was found by hotel staff unresponsive. I've never read anything but nice things about this guy, he leaves behind a pregnant wife (due next month). He had been battling Dengue fever (and mosquito transmitted tropical disease that you do NOT want) and its looking like that's what killed him. That is horrible. A totally treatable disease, granted you have access to the care.